More than the country’s stock market, it is the livestock economy to which Prime Minister’s appeal of unleashing the “animal spirit” is applicable. Particularly when the country faces the threat of a severe drought. Drought impacts farmers in direct proportion to their economic status. 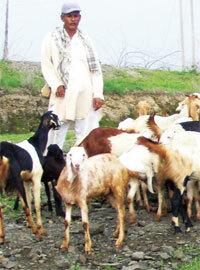 During drought, livestock assumes the role of a shield for farmers, mostly small and marginal. Farmers are increasingly turning this buffer economic activity into the primary one in the face of agrarian crisis. Such is its importance now that availability and health of livestock will decide how quick will be the recovery from the impact of drought. In mid-July, the verdict will be out on whether 2012 will be a drought year. Slow progress of monsoon in June and the first week of July points towards the high probability of a drought. Of all the drought indicators, the common one in both the agriculture seasons is rise in fodder price. During droughts, supply of fodder becomes limited—crop residues are used as fodder. On the other hand, in the face of crop loss, farmers depend more on livestock. This adds to the demand on the already scarce resource, thus raising the price of fodder. But this traditional equation has now changed. Livestock rearing is an economy equal to cultivation. Drought or no drought, livestock well-being decides farmers’ overall economic well-being. Livestock is now a big economy worth Rs 3,40,500 crore in 2010-11, with its growth rate fast surpassing that of the country’s overall economy. The government has already refreshed and uploaded its crisis management plan (CMP), a comprehensive document with details on how to see a drought coming and to prepare for it. It is a set of interventions needed to avert various impacts of drought. But CMP defines itself as “the crisis recovery model based on past experiences”. But past experiences in drought management show grossly inadequate importance to livestock. Drought is a regular affair in India—68 per cent of the sown area is vulnerable, and impacts 50 million people every year. Livestock is both the victim and the hope during drought. Sometimes it results in a large number of casualties. Lack of drinking water and rising price of fodder force people to abandon their cattle. In Madhya Pradesh and Uttar Pradesh, drought killed close to half a million livestock in 2009-2010. In Maharashtra, facing severe drought after the winter crop failed in 2012, farmers abandoned thousands of cattle due to scarcity of water and fodder. On the other hand, they are the much-sought-after drought shield for farmers. A good stock of livestock can ensure sustenance in the face of agricultural loss. During drought, cattle sale increases substantially in Pushkar fair. Despite this dual burden, livestock does not get much government attention during drought. While the emergency relief focuses on human beings, the only relief offered to livestock are a few feeding centres. India does not have enough fodder. At present, the deficit of dry fodder, concentrates and green fodder is 10, 33 and 35 per cent respectively. Food production is increasing, but the change in cropping pattern—commercial crops replacing the traditional cereal crops—has nullified its impacts on availability of crop residues. There is no inventory for water availability for livestock. Various diseases result in 18 per cent loss of potential in the livestock economy. In such a situation, recovery from drought will take much longer. Poor farmers with livestock may survive a drought, but will take more time to recover now. Crops and livestock contribute equally to farmers’ income and drought impacts the two equally. However, policies do not support their livestock, thus prolonging their recovery period. In chronic drought-prone areas, the situation is worse. In these areas, livestock contributes more than 50 per cent of the local economy. So, their recovery after a drought takes more time. In India a region gets at least two droughts in five years. Studies show that recovery from a severe drought takes two to three years. This means that a farmer in India is in perpetual crisis. But with livestock gaining prominence, it will intensify farmers’ economic crisis further. In the changed context of livestock economy being larger than the foodgrain economy, the conventional drought management needs to be overhauled. While most of the recent changes in drought management pertain to early warning and preparation, in case of livestock it has to be a much wider change. In the early 1980s, watershed development took precedence as drought-proofing mechanism. This was to preserve soil and its health. A similar approach may be the right response to the new reality facing rural economy.